Canola producers can lose up to five bushels or more per acre if the combine isn’t adjusted properly. Here are tips to measure combine losses and make adjustment to limit those losses, putting more canola in the bin and reducing the volunteer canola seedbank in your fields. This video has similar instructions. 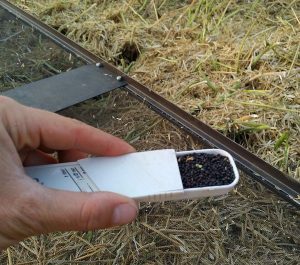 Electronic loss monitors will not accurately measure losses out the back of the combine. They give a vague idea whether losses are changing and the source of the loss, but won’t tell how many bushels per acre are thrown over. 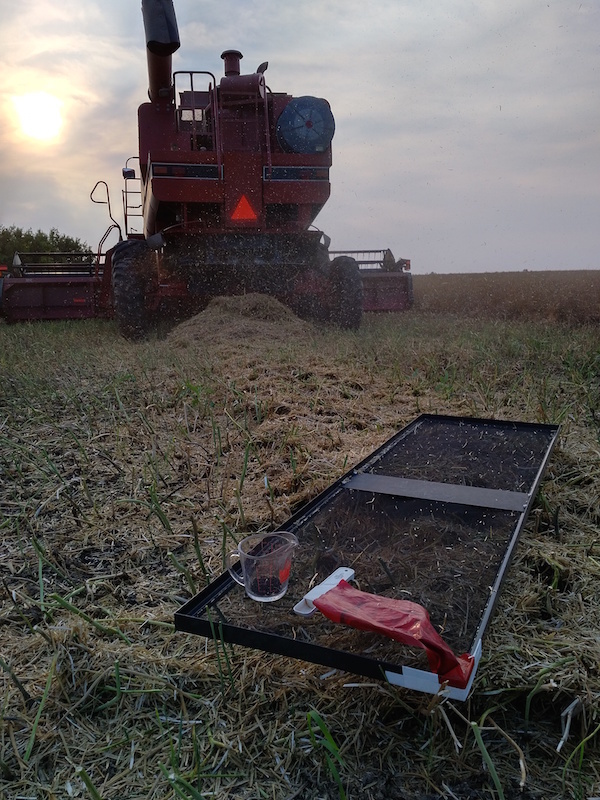 The loss monitor should be calibrated by taking proper measurements behind the combine. Option 1. Various companies make a discharge-width pan that attaches under the belly of the combine. 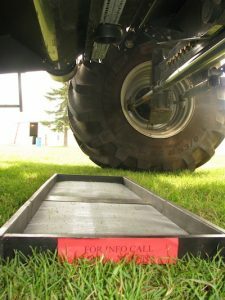 This type of pan is likely the safest option, and allows the combine operator to perform the checks on their own. These pans can either be set up electronically, with the addition of an electromagnet, or mechanically by simply attaching it via a form of pulley/rope. This pan connects to the belly of the combine with a magnet, and drops with the flick of a switch in the cab. Option 2. A pan mounted on a stick allows for deliberate placement to check the specific source of loss (right or left side, off the chaffer or off the rotor). It can also help to keep the user out of the dust. Option 3. A “throw pan” can simply be thrown in front of the rear wheels of the combine to land in the discharge area. This method is the hardest to control, with the potential for running the pan over, not having it land in the appropriate spot, or tipping over in the stubble. Beyond that, there are serious safety issues with such a method. With all three methods, the size and style of the pan depends on how the operator prefers to check. For instance, divisions in a pan can inform where exactly the losses are concentrated. A pan that is equal to the width of the discharge area can remove some potential sampling error, and allow for one measurement to indicate total losses. A smaller pan requires multiple measurements to be taken across the width of discharge. Any size pan can be used — the square footage just needs to be known to perform the calculations. 1. Disengage the spreader and straw chopper and move them out of the way. That way, all straw and chaff drops straight down over the pan. This is important for calculations, as losses will typically not be uniform across the width of spread. 2. Drop the pan, throw the pan or hold the pan. When using the stick pan, move it into position upside down so it doesn’t gather any losses ahead of time. To position the pan, walk behind and to the side of the rear wheels and extend the pan to the front of the chaff and straw discharge area. Once the pan is in position, quickly flip it over and stand still until the combine has passed over the pan. 3. Remove the straw and chaff and preserve only the seed. This can be done by hand relatively well, but a screen or sieve works best. Another method is to put the collected sample in the bottom of a deep five-gallon (20-litre) pail and stick a blower or old hairdryer into the pail. Chaff and straw will blow out and leave the seed behind. 1. Measure the seed in the pan. This can be done by weight (grams) using a scale or volume (millilitres) using measuring spoons or volumetric cylinders. The weight method is more precise, but the volume method may be slightly easier to perform in the field. For more on these options, click here for a link to the Combine Seed Loss Guide. 2. Calculate based on one square foot. If your pan is two square feet, for example, divide the measurement in Step 1 by two to get the total for one square foot. 3. Determine the concentration factor for your combine. This is a ratio of header width and combine discharge width. If you are picking up a swath, this will be based on the swath header width, not the pick-up header width. For example, if the cut width is 30 feet and the discharge width is five feet, then the CF is “6.” Find the tables here. 4. Plug these numbers into the tables to get losses in pounds or bushels per acre. 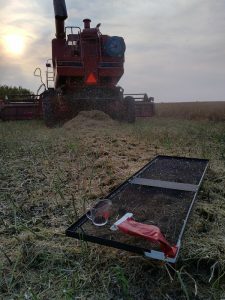 For example, if the cleaned sample amounts to 6.2 grams per square foot and the combine CF is 6, this converts to a loss of 100 pounds per acre — or two bushels per acre. 5. Take another sample before moving on to steps 2 and 3. *The web-based app from agrimetrixapps.com allows you to skip 2 and 3 above by just plugging in the appropriate information. A 1% loss is about the best you can expect. Combines running efficiently will lose some grain. If the target is zero losses, you will be running too slow to get the job done in a timely fashion. 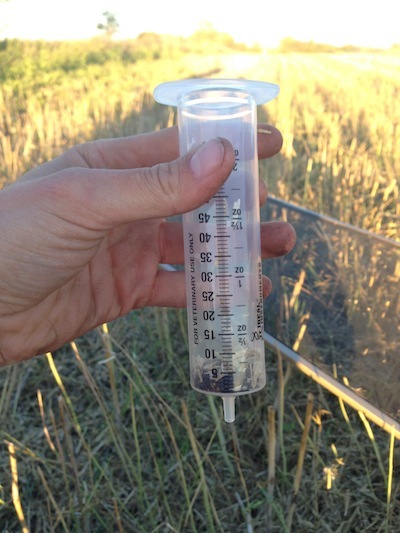 On a 40 bu/ac canola crop, a three to five bushel loss represents 7.5% to 12.5% of the potential yield. Reducing those losses can provide a significant boost in profit. 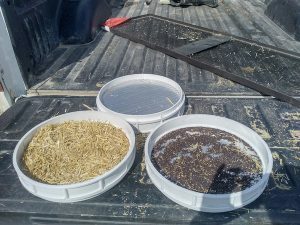 An acceptable loss rate strikes a balance between productivity, saving grain, and a clean sample. For some, 1% is worth striving for. For others, 3% might be best if the harvest season is tight and it means they can keep the feed rate up and harvest an extra quarter section per week per machine. 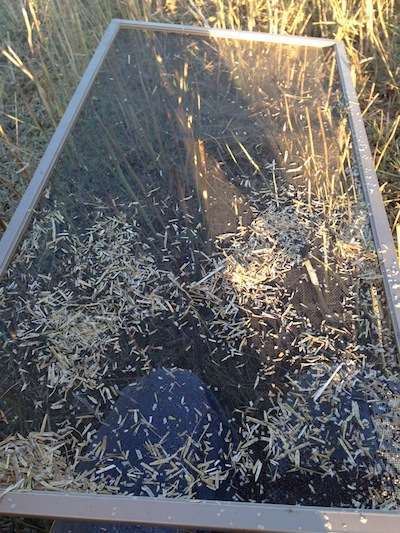 Straw conditions can sometimes be the limiting factor when it comes to threshing losses. If setting changes and speed changes do not significantly change the degree of threshing losses, the only answer may be waiting for more drydown. The risk of waiting needs to be weighed against the potential for reduced losses. Check for leaks. Losses do not always come out the back end. Before making any adjustment to cylinder speed, concave spacing, fan speed or sieve spacing, check over the combine to make sure you don’t have any leaks. Look for holes and cracks on the pickup, feederhouse, elevator, shoe seals, separator covers and the grain tank. Feed the combine properly. Rotaries work best with a narrow windrow. Conventional walker combines work best with a wider swath that creates an even mat over the full width of the cylinder and walkers. In PAMI research conducted by Les Hill, where an even mat resulted in losses of 2.2%, losses rose to 7.5% when the bulk was concentrated down the middle and 12.3% when the bulk was on one side. The simple reason is that air can’t move through the mass and the mat carries unseparated grain out the back. Slow down. It may take just a small decrease in speed — say 0.2 or 0.3 mph — to provide a significant reduction in losses, Hill says. The loss curve tends to remain fairly flat until ground speed reaches a critical point when combine capacity is taxed, then the loss curve can rise steeply. “When a combine hits that wall, a lot of the time it’ll start dumping grain out the back,” Hill says. When testing for your combine’s sweet spot, reduce speed in small increments and keep throwing out the pan to check losses. Make adjustments. If losses are far too high, try starting out with the manual’s suggested settings and go from there. Change only one variable at a time and check losses in between so you can be sure what has either helped or hindered the loss situation. Check that automatic settings are properly calibrated. For instance, if the chaffer setting on the monitor says 18mm, take a ruler and check that the chaffer spacing is in fact 18mm. —If you find unthreshed pods in the chaff, the combine is underthreshing. Increase cylinder or rotor speed, narrow the concave setting, add concave blanks, or slow down. —Losses can also result from overthreshing, or going TOO slow. If straw is getting pulverized into small pieces that drop down to the sieves, thus reducing air flow and separation, this is usually a result of overthreshing. Cracked seed is another sign of overthreshing. Consider lowering the cylinder speed or widening the concave setting. This adjustment may also make it possible to drive faster and keep losses constant.